Toshiba may soon make the batteries in some electric cars. Image from Flickr. The bane of most electric car manufacturing, the battery, is always the sticking point. Toshiba, Mitsubishi and Volkswagen are now working together to hopefully create a car battery that can stand up to most driving. The intention is that these Toshiba electric car batteries will help electric vehicles go farther, charge faster and be more economical. Ever since electric cars have been on the drawing board, the battery has been the big question. 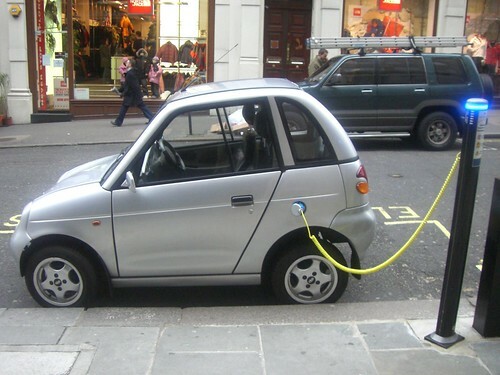 An electric car relies on batteries for power, and those batteries are notoriously heavy, short-lived and take a long time to charge. The Toyota Prius solved this problem by making a battery-gas hybrid. In the push for all-electric vehicles, however, the race to develop better batteries is in full swing. Tesla motors is currently the big name in electric vehicles – and this is partially due to its battery technology. Tesla’s electric roadster that goes for $109,000 has a 300 mile range, but the high price tag is definitely a barrier. The Nissan electric Leaf is only $25,000, but the battery only lasts for about 100 miles. Toshiba and Mitsubishi have partnered up to create a SCiB — Super Charge ion Battery — that will be long-lasting and relatively inexpensive. Currently, Panasonic supplies batteries to Honda and Ford, while Hitachi supplies General Motors and NEC supplies Nissan. The Toshiba push to create an electric car battery fits right into the technology the company has long been developing. Already, Toshiba develops and sells motors for bullet trains, machinery and elevators. By combining its SCiB battery technology with its engine know-how, the company is going to be building motors for a Ford hybrid in the next few years. Toshiba is also partnering with Mitsubishi to launch a Peugeot/Mitsubishi/Toshiba electric vehicle in Europe. Additionally, Toshiba is partnering with Volkswagen to create an all-electric vehicle. In short, electric vehicle technology is improving and battery life is set to get better. All around, good things for the zero or near-zero emissions vehicle market. Wow! Very exciting to hear that battery makers are beginning to work on this. Something worth taking a look at might be the invention of Electron Transport Company's conversion kit. Would be interested to hear your take on it.